An interior warm tone black and white view of the beautiful St. Sebastian's Church in Salzburg, Austria. Have you ever had trouble making photos? Perhaps you’re tired or uninspired. Maybe the weather is bleak or the light uninteresting. Despite the best intentions and the desire to make a great photo you find yourself unable to see an interesting subject or composition. 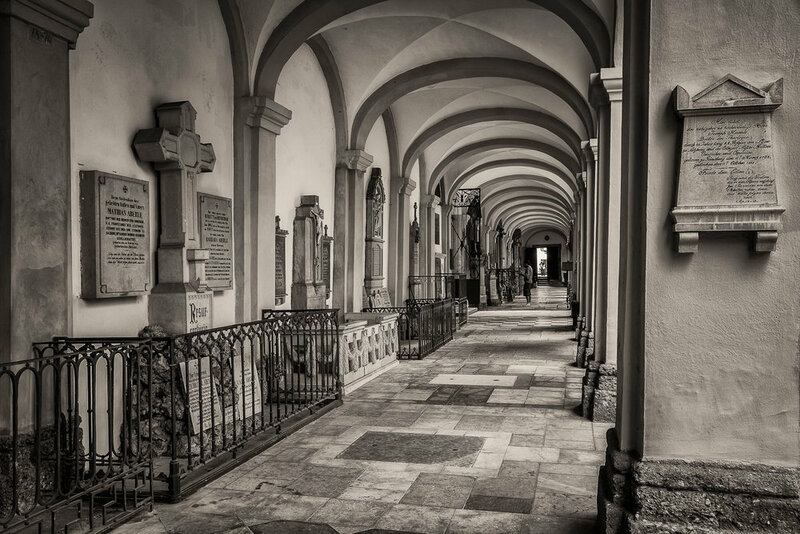 The photos in this post were made in the lovely St. Sebastian’s Church and Cemetery in Salzburg, Austria. The light was low, yet wider views both inside the church and in the adjoining cemetery were very high in contrast. 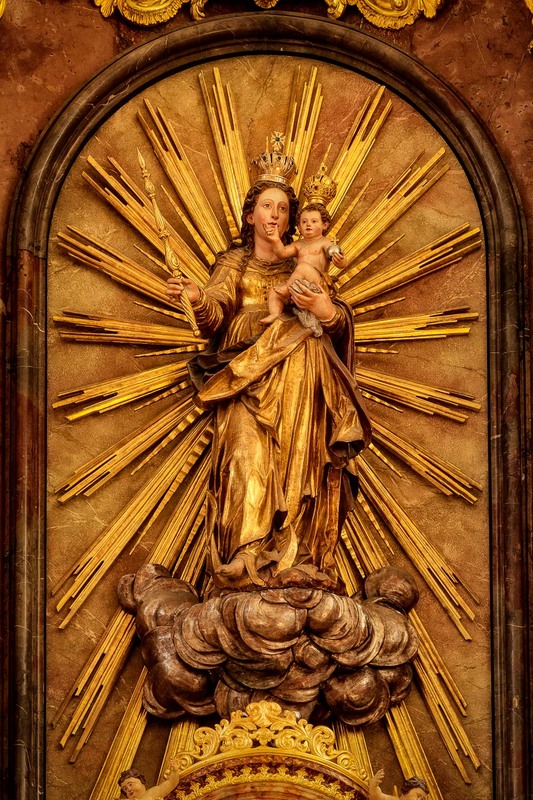 A statue of Mary and Jesus on an inner wall of St. Sebastian's Church in Salzburg, Austria. A tripod would have allowed me to manage the low light levels and reduce the contrast of the scene through a HDR (i.e., High Dynamic Range) sequence. However, as I didn’t have a tripod with me it made sense to concentrate my camera’s attention on a range of beautiful details throughout the Church and along the four arcades, built in the style of an Italian campo santo, surrounding the cemetery. The above image of the statue was one such example. It illustrates Mary holding the baby Jesus. Their elevated position, above the congregation, was no doubt designed to re-enforce their corporeal existence. The moral of the story is that it takes more than just being there with your camera at the ready. What’s more, wanting a photo isn’t enough. Sometimes you have to look hard to find the subject and work to make a good composition. 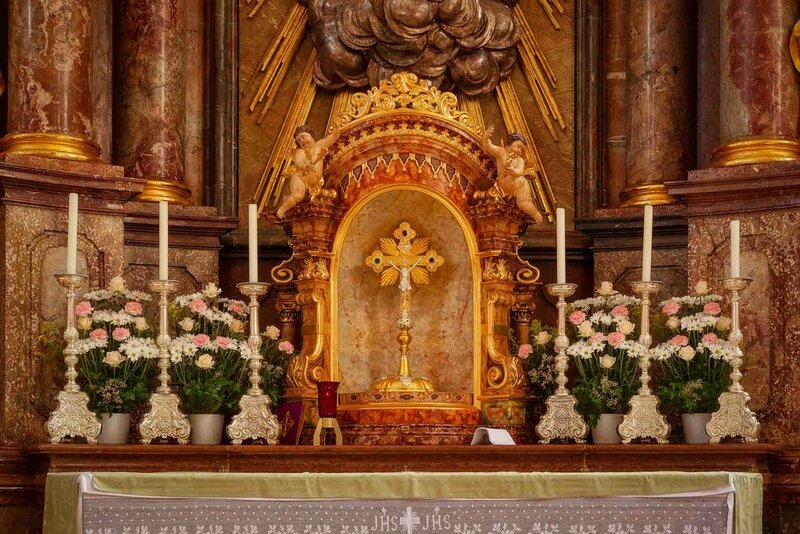 A beautiful detail of the altar at St. Sebastian's Church in Salzburg, Austria. Concentrating your attention on an interesting detail within the larger environment is a great way to minimize clutter in the frame and concentrate your audience’s attention on the subject or message you wish to explore. Fortunately these smaller details are often more evenly lit than is the case with larger scenes, making it easier to manage contrast and achieve a good exposure. Next time you’re having trouble making photographs consider the detailed view as a way to explore larger ideas. Look left, right, up and down. And, by all means, turn around. You never know what interesting or unique opportunities for great photos will appear when you do. 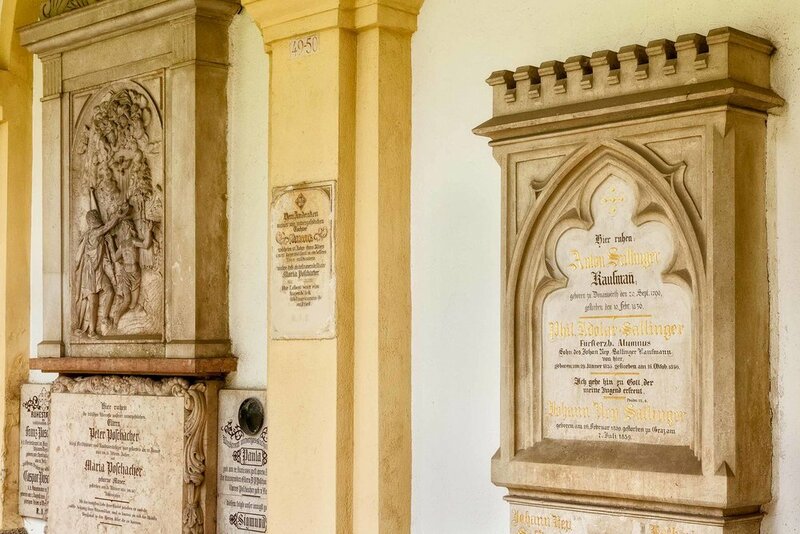 Headstones and plaques along one of the four arcades surroudning the graveyard at St. Sebastian's Cemetery in Salzburg, Austria. Photography is a physical endeavor and movement is often the best way to fire the brain and to discover new subject matter, interesting perspectives, elements of composition (e.g., shapes, lines, textures, color) and more inspiring light. Movement can be the beginning of great photography and often the best thing you can do to turn a lacklustre moment into a creative opportunity is to move your subject or yourself. Move yourself and/or move the subject.